Increasing "social connectedness" is considered by some Internet observers as a problem but why? Isn't everyone and their third cousins already connected? Who can ignore we have gone through multiple iterations of the digital age and are well on our way to talking to and taking full command of our computer systems? Social observers beg to differ; rather, the information age has taken command of us. We all click on walled communities of people who think and buy and behave like us, but walled communities do not compensate for the mental health quotient of connectedness away from our computers. designboom said this: "it is the most connected of times; it is the least connected of times." A team of researchers interested in social connectedness have recognized the potential in leveraging both worlds of technology with real-life social outreach. The link is a robot, named Fribo. They have described their work in their paper, "Fribo: A Social Networking Robot for Increasing Social Connectedness Through Sharing Daily Home Activities from Living Noise Data." The authors are Kwangmin Jeong, Jihyun Sung, Haesung Lee, Aram Kim, Hyem Kim, Chanmi Park, Youin Jeong, JeeHang Lee, and Jinwoo Kim from Yonsei University and KAIST (Korea Advanced Institute of Science & Technology). Their paper was presented at HRI 2018 (Human Robot Interaction) in Chicago. So, what exactly is Fribo? This is a robot they worked up intended for people who live alone but could have an opportunity, supported by Fribo's capabilities, to spend time with others. "We believe that Fribo is a robot that reconciles the conflicts between privacy intrusion and social connectedness through sharing daily activity information gathered from living noise," they wrote. The key to all this is their concept of "living noise," applied to what makes Fribo do its job. Basically, the robot has been engineered to recognize "the living noise" at the user's residence. The information is shared with friends also using the robot. What kinds of sounds? designboom said these Fribos were programmed to listen, for example, to the sound of a door opening, a knock-knock on a countertop—tiny sounds. Evan Ackerman in IEEE Spectrum said, "Fribo can recognize noises like a vacuum cleaner motor running, a microwave turning on, a running washing machine, a refrigerator door opening or closing, noises from entrance doors or specific room doors, and more. Over time, with your help, it's able to learn what new noises mean." Ackerman noted its ultrasonic sensor, which can detect if you are in the room, along with temperature, humidity and ambient light sensors. Justin Diaz in Android Headlines said the robot has the ability to alert you to the happenings of your friends when you arrive home just as it can alert your friends that you walked in the door. "This works sort of like a briefing of the day's events, but instead of everything that happened throughout the day it gives you a brief mention of activities that have been completed by your friends, such as the fact that they've arrived home before you." One would assume this is yet another home assistant robot specially designed for the infirm and the elderly? False. "The rapid increase in the number of young adults living alone gives rise to a demand for the resolution of social isolation problems. Social robot technologies play a substantial role for this purpose," the authors wrote. Nonetheless, existing technologies, they said, try to solve the problem through one-to-one interactions with robots, and these fail to use real-world social relationships. If Fribo is constructed to report information based on living noise, what about privacy sensitivities as in phone conversations? The authors had that in mind when designing their project; they said they identified in-home activities that can be shared. Examples include front-door and window-related activities, but they omitted phone talk and "activities in relation to the bathroom (i.e., bathroom door, shower, flush and toilet)." In their study, they recruited 70 participants (25 males and 45 females). The authors sought guidelines in making their first prototype. Twelve prototypes were deployed in the participants' homes. The authors in their paper discussed their "social networking" robot (or SN-Robot). In a 4-week field study, they evaluated if the SN-Robot was effective in diminishing loneliness without violating privacy. They also asked if the robot was effective in enhancing social connectedness. Participants' journal entries revealed the rate they listened to a friend's activities during the day, episodes triggered by the SN-Robot, and the number of messages and phone calls they received every evening. The SN-Robot imparts the sense of living together remotely. A participant commented that "I can imagine what my friend is doing and I feel like we live in the same house, but in another room. It's like sharing daily life activities with friends." The authors said a concrete picture of a friend's activities can increase the sense of realism, and boost the feeling of physically being close to one another. Fribo was developed on a Raspberry Pi 3, according to the authors. The configuration was divided into input and output. For output, 1 LCD and two speakers. The facial expressions are on a 4-inch LCD. Two speakers at the bottom-left and bottom-right audibly express the activities picked up by the two microphones. Future? "It's unclear what the future holds for Fribo," said Fortune. "The robot was designed to test how artificial intelligence could help with loneliness and there's no telling yet whether Fribo will make its way to store shelves." Ackerman weighed in. "The researchers note that since the study was conducted in Korea, they're not quite sure how successful Fribo would be in other cultures. They'd also like to try a much longer study (a year), and try Fribo out with family groups as well as friend groups." Ackerman said that he found the idea of Fribo "surprisingly compelling." If ever produced, he added, "it would likely be super cheap, and I appreciate how it handles privacy." The rapid increase in the number of young adults living alone gives rise to a demand for the resolution of social isolation problems. Social robot technologies play a substantial role for this purpose. However, existing technologies try to solve the problem only through one-to-one interaction with robots, which in turn fails to utilize the real-world social relationships. Privacy concern is an additional issue since most social robots rely on the visual information for the interactions. To this end, we propose 'Fribo', auditory information centered social robot that recognizes user's activity by analyzing occupants' living noise and shares the activity information with close friends. A four-week field study with the first prototype of Fribo confirms that activity sharing through the use of anonymized living noise promises a virtual cohabiting experience that triggers more frequent real-world social interactions with less feeling of privacy intrusion. 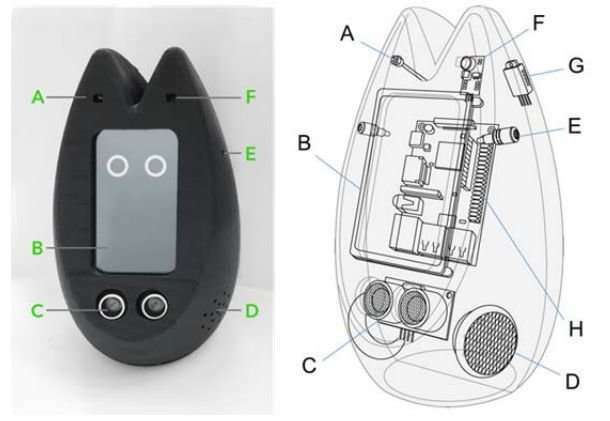 Based on this finding and the further qualitative analysis, we suggest a design principle of sound-based social networking robots and its associated new interactions, then present the second prototype of Fribo inspired by the implications from the field study.